As the federal budget season moves into full swing, infrastructure is not only on the table, but in the centre of the table. The Obama administration budget, which would cut some areas of spending and freeze others, calls for more infrastructure spending, including high-speed rail, wireless Internet, and modernization of the electric grid. Across the aisle, House Republican leaders, vowing to “leave no stone unturned and allowing no agency or program to be held sacred,” envision infrastructure cuts, including Amtrak, EPA grants for municipal clean water, and other programs. Some Republicans want to outdo the leadership and cap federal spending at 20 per cent of GDP, something that would require even more drastic infrastructure cuts. Consider dams, for example. There are more than 85,000 dams in the United States with an average age over 50 years. Some 4,000 dams are rated as deficient, including 1,819 high hazard dams. 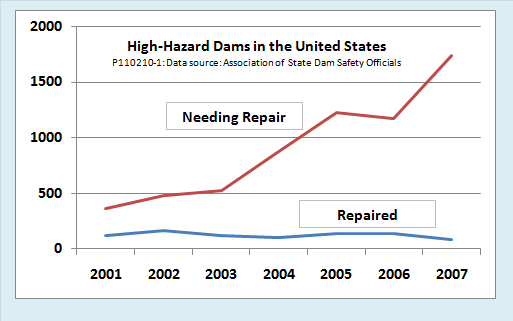 As the following chart shows, for every deficient high hazard potential dam repaired in recent years, two more were declared deficient. The same story repeats itself in one category of infrastructure after another. The Report Card estimates 5-year infrastructure spending needs at $2.2 trillion. Actual spending is expected to be less than half of that. The 2009 fiscal stimulus package, the American Recovery and Reinvestment Act (ARRA), included $72 billion for infrastructure upgrades, but that was enough to cover only six per cent of the 5-year infrastructure deficit estimated by the ASCE. These realities suggest why we have to be very careful when cutting infrastructure spending. Cuts to essential repairs and upgrades will decrease the federal budget deficit only at the cost of increasing the infrastructure deficit. The trade-off is especially unfavorable when deferred maintenance leads to costly catastrophic failures. And realistically, just eliminating the infrastructure deficit isn’t enough. Future economic growth will require an infrastructure surplus, so that wireless communication networks and renewable energy grids can be built at the same time needed repairs are made to ageing sewers and bridges. Another useful infrastructure report, this one from the Bipartisan Policy centre, tries to address that question. Although it focuses specifically on transportation infrastructure, it makes some common sense recommendations that are more widely applicable. Be sceptical of the “jobs multiplier” rationale for infrastructure projects. Focus on the outputs from infrastructure spending, not the inputs.